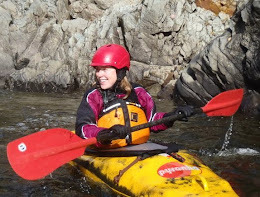 Summer's winding down but NWB members continue paddling local runs, travelling to paddling festivals, and finding prime features. The season has been marked by a handful of new paddlers who have really made an investment in time and energy to get themselves on rivers, upping their skill sets and confidence. Pictured above is newbie Erin getting a sweet ride at Surf City. The season began with a handful of runs on the Willow. A bit further East, the Bowron soon came in, forming the local favourite Wayne's World wave. The wave can often come in for a short period of time, before the river level drops again. But this year the river kept rising. Thankfully, the log jam that helps create the eddy service to the wave didn't blow out. It looked like it might on a few occasions. With the rising water came the formation of a new wave. It quickly became known as the Brown wave, perhaps due to the colour of the water at this time of year. 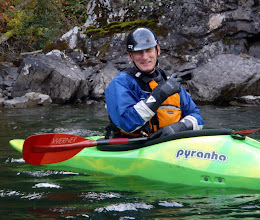 The high water also forced paddlers to be creative with the run through Portage Canyon. Part of the Vama Vama FSR washed out, and paddlers opted to take out at Box Canyon off the Beaver FSR. Pictured below is Jason and Al at the Brown wave. Nine boaters made an early June run on the Blackwater, a seldom run river an hour Southwest of PG. The run is made challenging by a 27km section of canyon beginning shortly after the put-in. It quickly turned "epic" as a paddler was injured in the first third of the run. This resulted in a five hour hike by the injured paddler and two others. Thankfully, Ross was ok, and all ended well with pizza and beers at the end of the day. In the picture below the road we hiked to is beyond the tree line! As levels dropped, play came in on the Willow, and some guy with a surfboard showed up to carpool to the river one evening. Most of us didn't know what to think of the guy doing the SUP thing, but he quickly gained respect from everyone. The balance and control required to do everything we do sitting on our butts, standing up, is phenomenal. Andrew later pushed the limits of local SUP with a great run on the Lower Lower Willow. 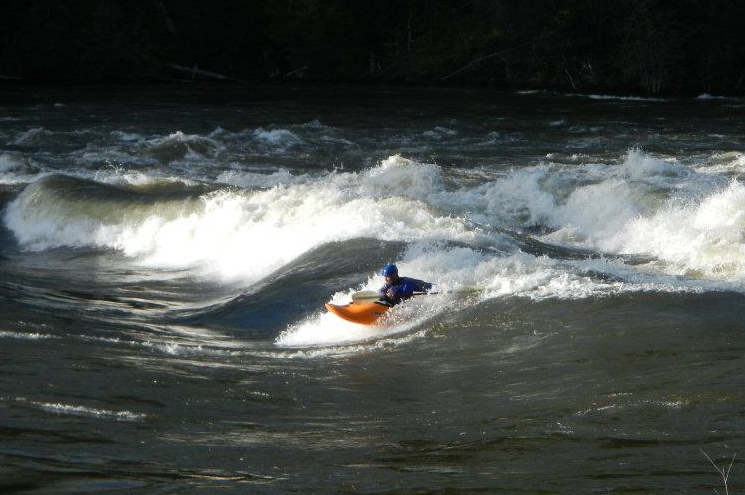 The summer also saw the rediscovery of a set of rapids, possibly un-run for 10 years. The Whitemud rapids on the Nechako river, which become "prime" at around four on the online gauge, are catch-on-the-fly, but provide lots of entertainment and the feeling of paddling "bigger water." Pictured below is Duncan McColl. 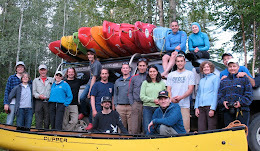 August paddling has been marked by trips by NWB paddlers to Clearwater, Skookumchuck Narrows, the Kananaskis river, and Tatlow fest in Smithers. 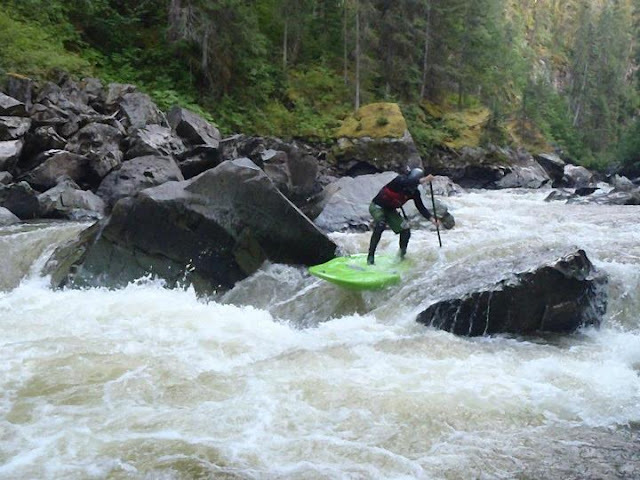 This weekend paddlers descend on Likely for runs on the Cariboo and Quesnel rivers, in anticipation of Likely fest in mid September. Spirits have been high with the growth of the club over the past year. However, there's also been an explosion of popularity on the club's Facebook page. Although it hasn't been rare to see 10 paddlers out for a run throughout the season, it's a far cry from the 100+ "virtual paddlers" on our Facebook group. So, if you've been following us on FB, send us a message, learn how to roll, and we'll do our best to organize a paddle that matches your ability level. Ciao, and happy paddling!